In fact, I stopped eating steamed crab, once my parents stopped feeding me. I hate having to spend time cracking open shells and legs just to get the smallest crabmeat ever. Too much labor, so little reward. On the other hand, I love going crabbing. It's actually why I picked this particular magnet up from the Tampa airport last week. I haven't gone in years, but my parents used to take us crabbing all the time, all along the Atlantic seaboard. We'd spend the night out on the pier and all night long, we'd check the chicken neck bait and empty the traps. So much fun. Looking back, it was probably just fun because we could mess around the pier in the middle of the night, and we were spending it outside, instead of tucked into bed. Though we wouldn't have as much fish as my parents hoped, we were always successful when it came to catching crabs - one morning, we ended up with a giant cooler filled to the brim with scritchy-scratchy live crab. Pretty awesome. And it's always a party when we get home from a fishing/crabbing trip - my parents can't ever wait to get those suckers into the steamers. Yesterday, we discovered a new seafood shop in Spencer (yes, Spencer) - they were stocked with live crab, which thrilled my dad to pieces. I swear, I could feel him wanting to throw me out of the driver's seat, so that we'd get home faster, so he could get the steamer going. It's been a while since I've seen live blue crab trying to escape our kitchen sink, but I'll tell ya, it was like I was ten years old again, watching him cook them and enjoy the hell out of eating them. 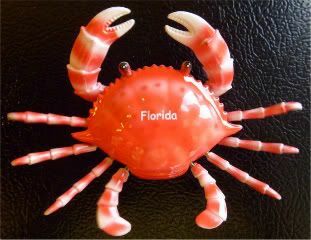 Of course, despite all my hints that said "I like crab, I just don't want to work for it", I didn't end up having any. Meet Me on Lake Erie, Dearie!